The red blood cell count is about 4.5 X1012 red blood, The white blood cell count between between 4-10 X109/L and platelet count is 150-400X109/L. The red blood cells have a life of 120 days and the platelets have lifespan about a week. The lifespan of leucocytes varies but for most is a week to two weeks. The need to renew these cells makes blood the tissue with the highest turnover. 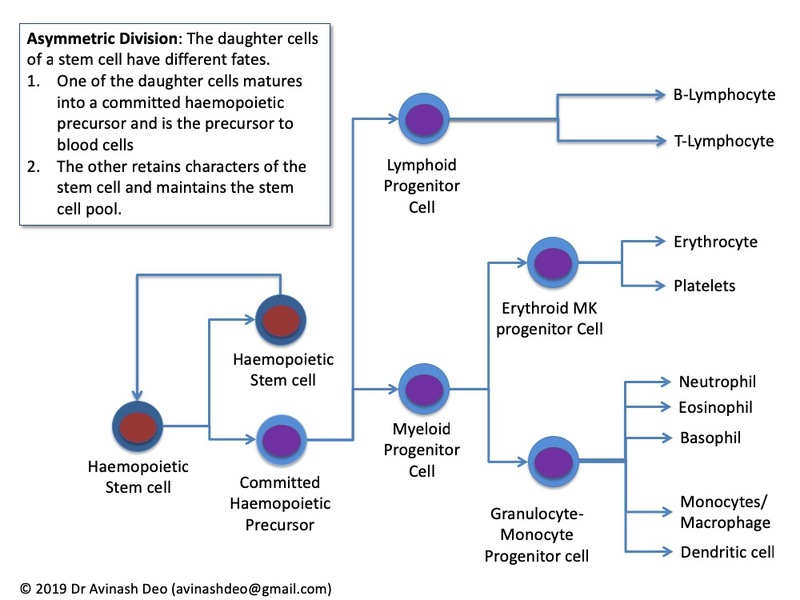 Haemopoietic stem cell (HSC) are progenitors of all blood cells. HSCs what is known as an asymmetric division (see figure below). One of the daughter cells matures into a committed haemopoietic precursor (CHP). This cell over succesive divisions gives rise to cells of the hemopoietic system. Maturation is accompanied by loss of ability to proliferate. The lineages this cells gives rise to include erythrocytes, leucocytes (neutrophils, eosinophils, basophils, monocytes, T and B lymphocytes, natural killer cells), platelets and dendritic cells. The other cell retains the properties of a stem cell. This is known as asymetric division, as the fates of the two daughter cells are different. Asymetric division ensures that stem cell numbers (stem cell pool) are maintained. Till the mid 1800s it was not known how blood cells were made. The following discoveries lead to the modern concept of haemopoietic stem cell, cells that could differentiate into all cell lines and proliferate indefinitely. They also established that these cells were in the bone marrow. Neumann and Bizzozero separately, in 1868, proposed that the bone marrow was the site of blood production throughout the postnatal life. Improvement in staining techniques lead to the discovery of a spectrum of cells in the bone marrow. Pappenheimer organised these cells into a tree. The least mature were put at the trunk, the more mature as the branches and the most mature as the leaves. He proposed that at the trunk was a cell that was so primitive that it could not be typed into any lineage. Ehrlich and Schilling differed from Pappenheimer in the number of precursors needed for blood formation. Ehrlich proposed two precursors and Schlling proposed three precursors. Conceptually stem cells were cells that could give rise to all cells of the blood and could replicate indefinitely. Till and McCoulloch were interested in developing an assay for radiosensitivity of marrow cells. Lethally irradiated animals that survive acute radiation sickness succumb to bone marrow failure. Till and McCoulloch transplanted lethally irradiated mice with bone marrow cells exposed to different doses of radiation. Bone marrow cells were able to rescue animals from the lethal effects of radiation: Animals infused with bone marrow cells survive the radiation and develop islands of hematopoiesis. These islands were in the form of nodules in the spleen. Dose response relationship: The number of the nodules that developed in the spleen were is related to the dose of bone marrow cell infused. A spectrum of blood cell developed and all cells originated from one cell: The colonies contained cells of erythroid and myeloid. The cells show different degree of maturity. This indicated that a cell residing in the marrow had the ability of producing myeloid and erythroid cells. Though early experiments did not demonstrate lymphoid colonies later experiments did. The presence of both erythroid and myeloid colonies did not prove that they arose from the same cell. They could have arisen from different cells. The presence of the same chromosomal marker (chromosomal translocation) proved that in all cells of a splenic colony arose from a single cell carrying that marker. Stem cell transplant involves infusion of stem cell in a patient who has been treated with very high doses of chemotherapy. The dose of chemotherapy kills cancer cells but also results in bone marrow failure. Infusion of stem cells prevents bone marrow failure. The success of transplant depends on infusion of adequate number stem cells. Identifying stem cells by surface antigens and estimating their numbers is quick and practical. Unlike the use of dyes, and does not carry the risk of damaging the stem cells. Unfortunately the exact pattens of antigen expression on a stem cell is not known. Antigenic pattens known to be present on stem cells are also present of cells that do not have stem cell properties. CD34 is a trans-membrane protein expressed on haemopoietic progenitors till the stage of committed progenitor cells. Cells expressing CD34 (CD34+ cells) form about 1% of the bone marrow nucleated cells(Blood 77: 1218-27; 1991). All cells expressing CD34 are not stem cells but expression of CD34 is used to asses the dose of stem cells to be infused for stem cell transplant. Addition of markers can forther enrich the population of cells collected in stem cells. CD38 is expressed in more mature cells that do not have functional properties of stem cells. Cells expressing CD34 but lacking CD38 (CD34+ CD38-) are a purer population of stem cells. Testing for other antigens increases the purity of stemm cell population. The most purest population of stem cells is cells that are CD34+ CD38- CD90+ CD45RA- Rholo CD49f+ and lack lineage specific markers. They become committed to a lineage. In the figure above the haemopoietic stem cell has lost the capacity to proliferate indefinitely but retain the capacity to give rise to any of the blood cells. The cell at the next levels can form only to lymphoid or myeloid cells. The next level cells are erythroid-megakaryocyte precursors and granulocyte-macrophage precursors. The former give rise to erythroid precursors and megakaryocytic precursors. The latter give rise to granulocyte precursors and macrophage precursors. An excellent post looking at hematopoietic stem cells and the work done with them over the years. And even a bit of a FACS cheat sheet at the end.